Welcome to Auer Boat Works! Services offered to anyone within Europe and the United States. If you have a large project, we'll travel to you! -Traveling Boat builder & Woodworker. Feel free to contact him by clicking here. Stefan is currently located in Switzerland, but if you have a large project he'll travel to you!! Find out more about rigging and mast by clicking here. 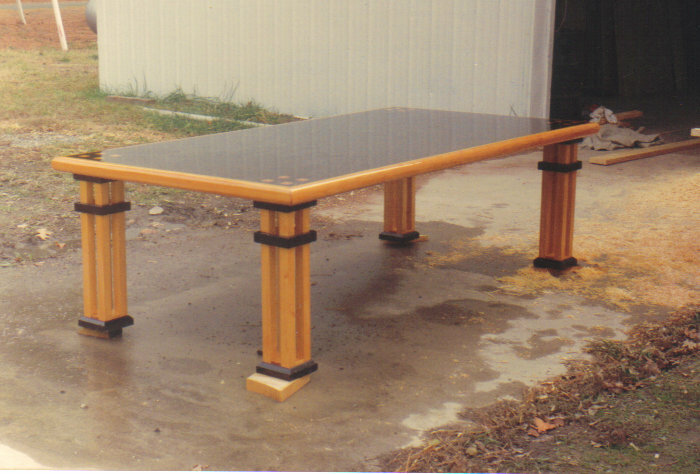 At Auer Boatworks you'll find excellent craftsmanship in many areas of the woodworking field. With years of experience, Stefan has accrued a vast knowledge of the application of different woods and finishes to give any project it's structural integrity and overall beauty. Stefan Auer is an accomplished boat builder who has spent his entire life living and working around sailboats. He was born in Switzerland, and as a young boy he was involved in racing small sailing vessels on lake Geneva. In his early adulthood he built a 40 foot, steel sailboat, named Wabi which he sailed for a short period on Lake Geneva, and subsequently crossed the Atlantic with her. He has spent many years living on Wabi and sailing to many locations inside and outside of the USA and West Indies, deciding finally on the Chesapeake Bay as his home port, and working mostly in Deltaville, VA. In Deltaville he was involved in many boat constructions, restoration projects, as well as building furniture and utilitarian items. There, he became titled master boat builder by the locals who desired his advice and skills on almost every difficult project taking place in and out of the boatyards. Stefan had his hand in building and participating on multiple boats at the local Maritime Museum including the John Smith Explorer. When requested by friends, Stefan returned on multiple occasions to Switzerland to construct boats and participate in multiple projects around Lake Geneva. Currently, he is located in Switzerland acting as an interior woodworker and providing consultation in the overall construction of a 50 foot aluminum sailboat. Previously, he completed his part in the restoration of an 8 meter classic sailboat on Lake Geneva. Overall, like many of the great artists and craftspeople, Stefan's skills have been developed and mastered mostly on his own, allowing him to step outside the structured bounds of boat building, to provide his own unique styles of beauty and craft, while at the same time researching and keeping in time with the latest materials and methods of construction. When building anything, structural integrity is his primary concern, following that is functionality, upon which, he "tops it all off" with beautiful details, shapes, fittings, and a perfectly laid finish. Stefan ultimately specializes in wood, however he is a competent steel worker, of which his own boat is built.